In this article we will cover three basic trading strategies you can use with above the market order types. You maybe thinking that order types is too negative, but you will be surprised to know that in some trading examples, you are required for example to sell a stock short on a bid up and not at market. If this sounds a bit confusing, don't worry as we will detail out the trading strategies you can use with above the market orders and not worry too much about special maintenance requirements from your broker. Above the market is an order type that executes above the current market price. This order can be to buy or sell a security at a higher price. For example, imagine Google is trading at $650.00 per share. Well, you believe that if Google breaks the psychological level of $700, the stock is off to the races. Unfortunately, you are going on a vacation with your family and are unable to watch the market. Therefore, you place an order to automatically buy 100 shares of GOOG once the stock is able to penetrate $710.00 per share. You go on your vacation, Google reaches $710 and the order is automatically executed to buy 100 shares. You go on your vacation. However, Google never climbs to $710 and the order is never executed. Now that we have covered the basics, let’s dig a little further. This is the order to buy the stock at a price, which is above the current price levels as discussed in the Google trade example. 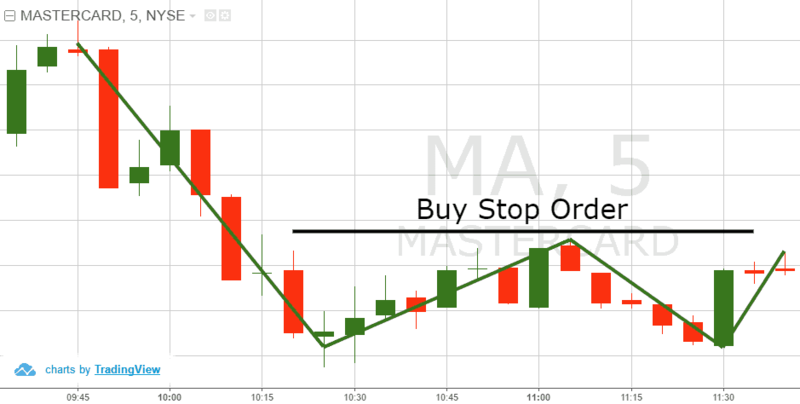 If you place a buy stop market order, then your broker will automatically execute an order to buy at market once the price is reached. You will not know at what price your order will fill, but given the right level of liquidity, it should be close to your buy stop order price. As a trader, you will want to place a buy stop order to open a long position on a breakout, or to close a short position that is going against you. Always remember, that you can play the market on both sides of the trade. This is the second above the market order type. When placing a sell limit order type, you believe that the market will run to a specific level and then fail. Therefore, you could be looking to either sell a long position to close your trade, or open a short position in anticipation for a price decrease. Again, remember you can always play both sides of the market. Let’s say you believe that Google will face very strong resistance at $700.00 and will enter a bearish trend. So, you place a sell limit order at $700 dollars to sell short 100 shares, which your broker will fill at this price. Now that we have discussed the two above market order types, let’s walk through a trading example of both. Above is a 5-minute chart of MasterCard from April 27, 2016. The green lines on the image indicate price action resembling a double bottom chart pattern. As you probably know, in case the price breaks the top between the two bottoms, we would expect MasterCard to increase. Unfortunately, we are unable to follow the market at this time for whatever reason (watching kids, meeting for work, etc.). Therefore, we place a buy stop order above the neck line of the pattern. Let’s see what happens next. Well, MasterCard breaks the desired level and the buy stop order is executed. The price then goes on a run and exceeds our target profit level. Now let’s approach the other above the market order type – sell limit order. The image below will show you how this type of market execution works. This is the 5-minute chart of Proctor and Gamble from May 25 – 27, 2016. As you can see, there is strong resistance in the $81.75 area. After watching Proctor and Gamble trade all day, we see that the stock is building support in the $81.20 range (blue horizontal line). It is clear as day that if PG breaks $81.40, which is the high of this small range, the stock will likely rally up to resistance at $81.75. Therefore, we place a sell limit order at $81.75 with the expectation PG will once again fail at this level. One point to note, is that if a stock has already tested a horizontal resistance level three times, I will not short the fourth. This is because if a stock continuously tests a level, at some point it is likely to breakthrough and the last thing you want is to be short on a stock that’s having an impulsive move. Well, let me get back to the trade example. After placing our sell limit order, PG does not reach our target of $81.75 to open a short position. So, we go about our business for the remainder of the day and the next trading day, where do you think PG ran to in the morning? That’s right, $81.75. So, our sell limit order is executed at $81.75 and to our delight, the stock immediately began to roll over. The key thing I would like to highlight, is that the sell limit order allowed us to (1) sell PG at a higher price and (2) execute a market order from the previous day without us having to do anything. This type of order is great if you are a day trader watching a large number of stocks in real-time, or if you are a swing trader that does not have time or quite frankly want to stare at a screen all day. Above market orders are just the execution method for placing your trades. Well, I would like to cover the chart examples that fit nicely with these order types, that way you can marry the technicals with the order execution methods. The buy stop order is very useful when trading chart patterns with bullish potential. Let’s look at a symmetrical triangle pattern and how we can use a buy stop order to enter the trade. Above is a 2-minute chart of General Electric from June 17, 2016. The image illustrates a symmetrical triangle (blue). The last time the price decreases to the lower level of the triangle we can place a buy stop order above the previous top of the upper level. This way, we will automatically enter a long trade in case of a breakout, which is confirmation that the triangle has terminated and a new uptrend is in play. As you can see, the breakout occurs and we are filled in $30.57 range. The price then enters a bullish trend and runs until the end of the trading session. The buy stop order is also very efficient for trading early morning range breakouts. If the price breaks the top of the range, there is a very high likelihood that the price will continue higher in the same direction. How much the stock will continue higher we do not know, but the point is the stock will continue higher. Let’s walk through a trading example, so you can better understand how to use a buy stop order during early trading. This is the 2-minute chart of Deutsche Bank from June 21, 2016. The image illustrates a big bullish gap on the opening bell followed by a bearish fill. This gives us a great opportunity for a buy stop order above the high of the gap. The price finally rallies higher and our buy stop order is executed above the high of the day. As you see, the price increases afterwards until the end of the trading session. If you are day trading, you should close the trade a few minutes before the end of the trading day. Imagine the price of a stock is trending lower. After a number of corrective moves higher, you can draw a downtrend line across these resistance levels. Therefore, you can place a sell limit order at this downtrend line in anticipation for the price to rollover and continue its downward move. This is the 3-minute chart of Twenty-First Century Fox from June 20, 2016. The image illustrates a bearish trend (blue), which the price bounces off of 5 times in a row! We do not trade the first two impulses, because they are needed to confirm the down trend. The confirmation comes when the price touches the trend line for a third time. We place our sell limit order at the trend line, which is executed when FOX touches the line. You will then want to book profits after a set percentage retracement, or a reading from another technical indicator. You essentially can repeat this process over and over again, until the price action tells you otherwise. To trade above the market means to set an order, which will be executed if the price reaches the desired level on the chart. Buy Stop: Buys the stock, when a specific price above the current price is reached. Sell Limit: Sells the stock, when a specific price above the current price is reached. The above the market order execution type is a very convenient way to trade the markets, when you are not hawking every tick (remember the vacation example). Remember to align the chart patterns and trading strategies with the above the market order types. After a while, it will become second nature when placing your orders.